Engines rrrrumble-vrum vrum vroom. Crane truck stretches out his boom. Mighty trucks roll out of bed. They've got a busy day ahead! Little ones can't resist the playful cranes, backhoes, mixers, and dozers who are all working together to build something… but what? With hints given along the way, kids will delight in discovering what this very special construction crew is building just for them. 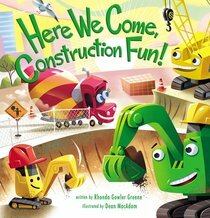 About "Here We Come, Construction Fun!"